Belize is easy to get to – there are many direct flights from the US, and European travelers can fly in to the US or Central America en route. The major gateways to Belize in the US are Atlanta (Delta), Charlotte (US Airways), Dallas (American), Houston (Continental and TACA), and Miami (American), all operating daily flights. It is roughly 2 hours flying time from Miami and around 2.5 hours from Charlottle, Houston and Dallas. For European travelers, British Airways and Virgin Atlantic fly direct from London to Cancun. 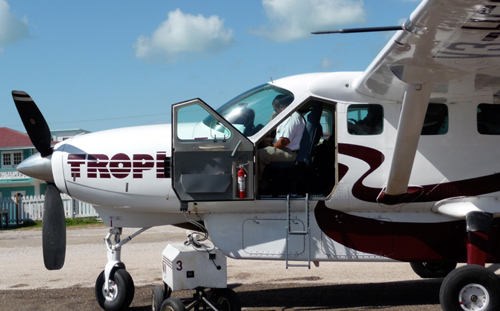 We’d recommend stopping for a night or two on the Yucatan Coast, which we can Tailor Make as part of your itinerary, before traveling overland to Belize, either via Chetumal in Mexico to take the express boat service connecting San Pedro in Ambergris Caye, or via Corozal in Belize and to take a short flight with Tropic Air direct to San Pedro. Once in Belize, domestic ‘puddle jumpers’ connect the mainland to the cayes and tourist destinations in the north and south of the country. The two carriers are Maya Island Air and Tropic Air. Be sure to have your camera handy as the views of the reef and cayes are breathtaking.